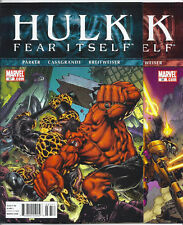 (2011) HULK #37 AND #38 RED HULK VS THING BATTLE! MODOK! FEAR ITSELF TIE-INS! DEADPOOL #37 NM 9.4 2011 VOL 2 STUNNING HULK APP. Hulk 39, 40, 41 Lot/Run (Marvel, 2011) Red Hulk versus Omegex Combine and Save!